Nintendo of Europe just launched a brand-new official Legend of Zelda homepage that links you to all the games currently playable on your 3DS or Wii systems. Aesthetically it’s all about Ocarina of Time 3D right now, but I imagine in the not-so-far future it’ll be updated to feature Skyward Sword and the series’ 25th anniversary specials. Whatever the case, the fact that this page appeared during one of the biggest years for Zelda ever suggests to me that it’s going to get a lot of use in the coming months. Our official hub for The Legend of Zelda series is now live! The Legend of Zelda: Ocarina of Time 3D is out soon for Nintendo 3DS! This remake of a critically acclaimed classic makes for an action-packed adventure featuring puzzles and combat, with an enormous world to explore and epic story to get your teeth into. It’s getting ever closer to June 17th – the release date for the game – and the excitement is building! Our official Zelda hub is the perfect place to find out all about The Legend of Zelda games, and it’s now live for all and sundry to enjoy! Head there straight away to take in all the Zelda goodness you can manage, and keep checking back regularly for updates – you never know what might appear! There are Zelda goodies up for grabs too: if you preorder The Legend of Zelda: Ocarina of Time 3D from GAME or Gamestation, you can get your hands on a special software box with a golden sleeve that contains an exclusive double-sided poster! If you just can’t wait for this epic to come out, why not tide yourself over with the new game trailer! 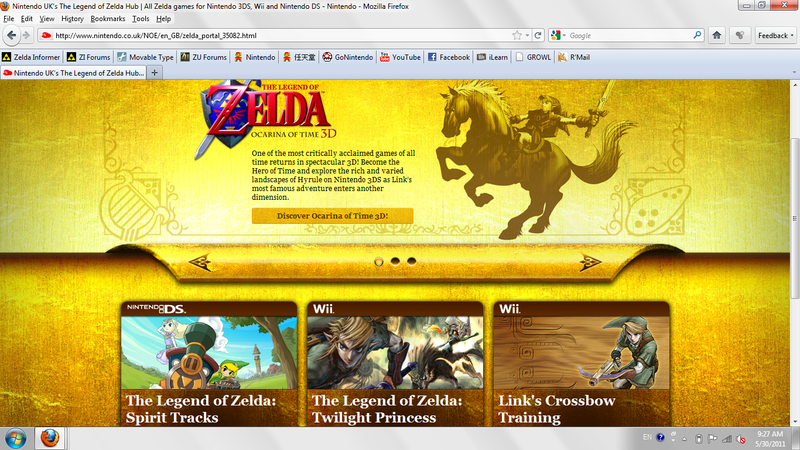 Check it out on the official teaser site for The Legend of Zelda: Ocarina of Time 3D! The Legend of Zelda: Ocarina of Time 3D will be in shops for Nintendo 3DS from 17 June!